The standard station come as a 3 Door unit, however this can be designed to include additional modules. The waste streams to be collected can be decided upon purchasing the recycling station (the picture is just an example of what we have completed for a number of companies). 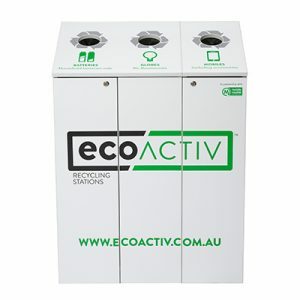 EcoActiv provides a new cost-effective collection station for councils and other large organisations. This low-cost product is the ideal system for managing Household Problem Wastes such as handheld batteries, light bulbs, fluoro tubes, printer cartridges and mobile phones. It has been developed to meet the needs of local councils. The stations are ideally suited to council foyers, service centres, libraries, community houses and educational institutions. Our range of modular recycling stations feature both indoor and outdoor models, and can be configured and manufactured from a variety of materials, according to your organisation’s requirements. The opportunity to include council branding and logos is also straightforward. The recycling stations are based on the highly innovative program initiated by the City of Sydney. ECOACTIV worked collaboratively with the Council’s team to implement a range of innovative recycling solutions, which include user-friendly recycling receptacles. Feel free to ring or email and we can talk about pricing, materials and features. You can download our Recycling Stations brochure here. You can view our Recycling stations pricing here.